Kombinat: great to look at and dirty as hell. If MusicRadar was going to be stranded on a desert island with just one plug-in developer, it might well choose Audio Damage. The guys there may not be great at whittling sticks or building shelters, but when it comes to producing great-sounding, innovative effects, The Damage´s record is second to none. 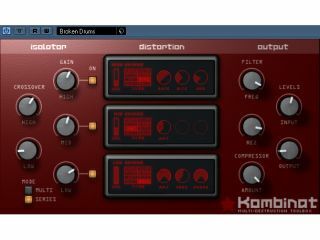 Its latest release is Kombinat, a multi-band distortion plug-in. This comprises a DJ-style three-band-killing EQ, three distortion engines (each of which contains seven algorithms) a self-resonating four-pole low-pass filter and an easy-to-use compressor (this is controlled with just one knob). Said to be capable of producing sounds that range from the subtle to the seriously destructive, Kombinat is available now as a VST and Audio Units plug-in for Mac and PC. It costs $49 and can be purchased now from the Audio Damage website (audio examples are also available).